Looking for a TM Lewin review or a TM Lewin shirt fit guide? Below you’ll find a detailed review of TM Lewin shirts, including the cuts and sizes available and the specific shirt measurements. If you are looking to compare TM Lewin to other shirt manufacturers then use the shirt comparison pages: Charles Tyrwhitt vs TM Lewin and TM Lewin vs Hawes and Curtis. You can buy the shirts direct from the TM Lewin UK and US sites by clicking on the images below. Four different fits are available. Regular Fit shirts are TM Lewin’s most generous cut, with the largest chest and waist size measurements. Fitted shirts are even narrower than the Slim Fit. Super Fitted shirts – TM Lewin launched this range in Autumn 2013 and these shirts are the narrowest around the chest and waist in their range. TM Lewin have expanded their range of Super Fitted shirts to include Stretch shirts. These Stretch shirts are 95% cotton and 5% Lycra. They are available here. Thomas Pink also offer a Stretch shirt with elastane, rather than Lycra. More information is available on the in the Thomas Pink Review. All sizes are in inches. The chest and waist measurements are the garment sizes. In the table below all measurements are in inches. The difference between your chest measurement and garment chest measurement should be four inches if you want a relatively tight fitting shirt. Add five inches for a more typical fit and six inches for a more relaxed comfortable fit. All shirt manufacturers I know of insert an interlining into the cuffs and collars of their shirts to make them more robust. TM Lewin construct their collars and cuffs differently from most other shirt manufactures. TM Lewin use non-fused interlinings, which mean that their collars and cuffs have a separated interlining which sits between the inside and outside material of the shirt. 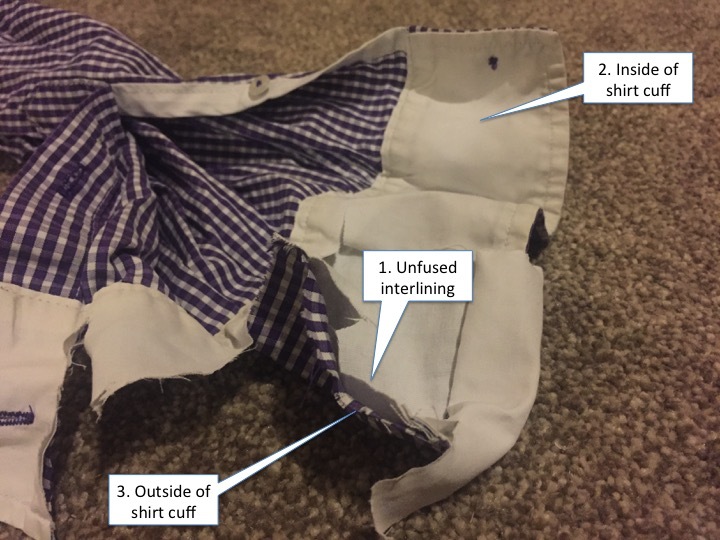 The image below shows a TM Lewin shirt I took apart. 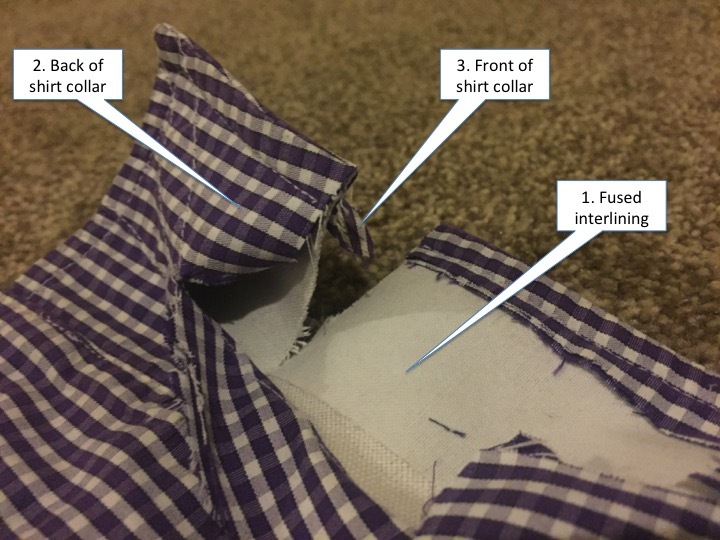 The image shows the interlining, (1), which is separated from the inside (2) and outside (3) of the shirt cuff. In particular, note the gap between the unfused interlining and the outside of the shirt cuff. This gap is because TM Lewin make unfused cuffs. The image below shows a cross-section of the collar of the same TM Lewin shirt. The same construction technique is used: the interlining (1) is separated from and not fused with the back (2) or front (3) of the collar. In the picture you can see that the interlining is sewn together to the inside and outside of the collar at the edge. TM Lewin began over 100 years ago in 1898 with a store in Jermyn Street, London, England. The TM comes from Thomas Mayes, who ran the original shop. TM Lewin only expanded to second shop in 1989, opening its second store in Lime Street London. In 2006 there was a management buyout and since then there has been rapid expansion. As of July 2018, TM Lewin had stores in the Australia, Czech Republic, Ghana, Indonesia, Philippines, Singapore, the United Arab Emirates and the United Kingdom. TM Lewin review – where are the shirts made? TM Lewin made its shirts in England until around 2006. As with Charles Tyrwhitt, there is little publicly available information on where TM Lewin makes it shirts. The best information I have is that today TM Lewin manufactures its shirts predominantly in China and Vietnam. 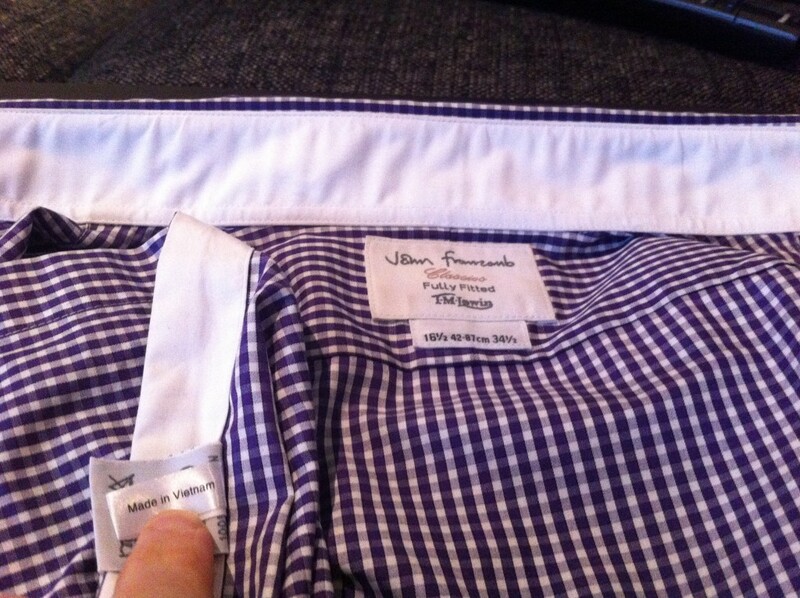 The most recent TM Lewin shirt I bought was made in Vietnam, as the picture above shows. This story suggests that TM Lewin gets many of its shirts from Itochu of Japan. Itochu has many different manufacturing sites across Asia. Shirts that fit like TM Lewin shirts? Shirts that fit like the TM Lewin Regular Fit? Try the Ledbury Classic Fit or the Lands End Traditional Fit. Shirts that fit like the TM Lewin Fitted Fit? There are no really close matches. The Brooks Brothers Milano Fit has a similar chest, but is wider in the waist than the Fitted Fit. Shirts that fit like the TM Lewin Super Fitted Fit? There are no really close matches. The Charles Tyrwhitt Extra Slim Fit has a similar chest, but is wider in the waist than the Super Fitted Fit.